See Havel's Scissors on ItsSewEasyTV.com Scissors for fabric, quilting, embroidery and more at Havel's Sewing. Your source for unique tools for your fabric arts. It’s Sew Easy began broadcasting weekly on itsseweasytv.com. Click here to see where to view in your area for those viewers who do not get the program on their local PBS channel.It's a great way to see the show, and for those viewers who just want to watch it again it's a great opportunity. Achieving a perfect fit inspires many to start to sew. Using custom measurements, sewing educator Joanne Banko creates a well-fitting boho skirt on the serger. Angela Wolf, author and designer, shows how to sew flat-felled seams for a tailored look. Then, she shows how to make custom-fitted pants and jeans that flatter any figure. 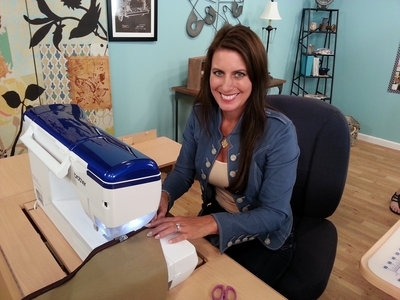 It's Sew Easy, episode 1012 will be airing on Friday, September 9th, for 7 days. Watch for Havel's scissors to be featured. You can also see It's Sew Easy on their YOUTUBE channel.